When it comes to busting the backcountry, you need to see and be seen. But, take one look at those flat panels the Jeep factory passed off as doors, and it’s easy to see they’re great for keeping you in—not so great for looking out. And, style? Forget about it. 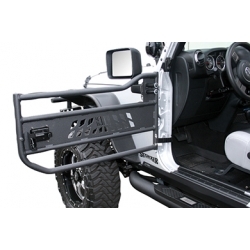 So, remove the blinders and soup up your style with a set of Aries Jeep Tubular Doors. 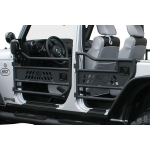 Crafted from T6 aluminum tubing, these tube doors for Jeeps are custom manufactured for an OEM fit. The tubular design opens your cab for maximum visibility, and lends a “tubular” off-road look. Plus, Aries TIG welds every joint for strength, and gives ‘em a rugged textured black powder coat finish for trail-ready style. Super easy to install, Aries Jeep doors bolt right to your Jeep’s factory door hinges. And, they’re sold in pairs for both front and backs door sets. What’s more, Aries backs your Tubular Jeep Doors with a totally tubular 5-year warranty.